You can define credit cards on the sales and service documents, which then allows the system to automatically charge the credit cards at posting of the invoice. However, customers might be setup with payment terms and want to take advantage of those terms, which means that you will not define a credit card at order entry. Customers can call you wanting to pay a posted invoice via credit card over the phone. If a customer is past due or over the credit limit, you can also require the customer to pay some outstanding invoices right away, before processing more orders. This can be also done via credit card. You have different possibilities to pay a posted invoice through credit card. You can pay an invoice from the posted invoice list or card, below shown is a posted sales invoice card. Once you have located the proper posted invoice the customer wants to pay, you can select the action “Charge Credit Card” to start the process of paying the invoice. This action is only available, if the invoice is still open. When you select the action “Charge Credit Card”, the “Charge Credit Cards” page is displayed allowing you to enter one or multiple credit cards. You can find more details about this page here. Once you have entered the amount to be paid on the page and selected the credit cards, the entered amount is charged against the card and a payment is posted. The payment is then automatically applied to the invoice. If the invoice was paid in full, the invoice is closed out. It is important to understand that the payment terms and any eligible payment discounts are respected when paying invoices via credit card. Another option is to pay an invoice via credit card from the customer’s account. 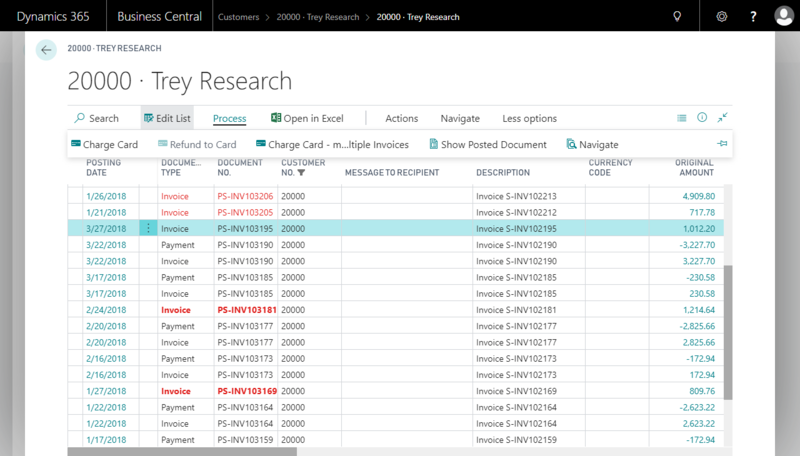 The customer ledger entries show all transactions for a customer, including all paid and unpaid invoices. If the invoice is still open, the action “Charge Card” is enabled in the ribbon. When selected, you will see the page “Charge Credit Cards” and you can enter one or more credit card information to pay the invoice. You can find more details about the “Charge Credit Cards” here. It is important to understand that payment terms and any eligible payment discounts are respected when paying invoices via credit card. 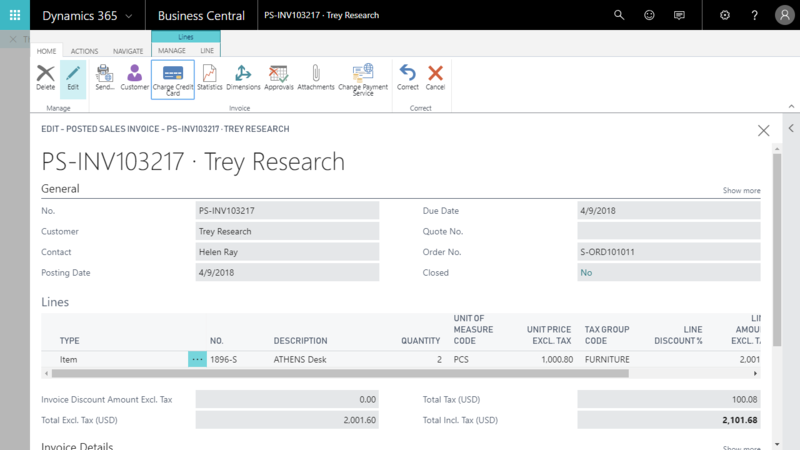 If your customer wants to pay multiple invoices at once, you can select the action “Charge Card – Multiple Invoices” from the action ribbon. This will bring up a list of all open invoices for the customer. You can select all invoices that you want to pay with a credit card. To select multiple records, you have to click on the “show more options” button (the three dots) and select “Select More”. 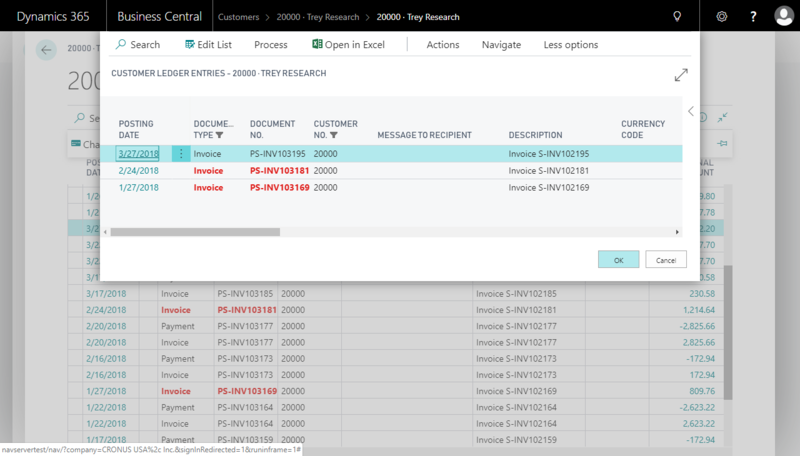 Then you can place a check mark next to all invoices you want to pay. Once you have all invoices selected, click on “OK”. This will show the “Charge Credit Cards” page. You can find more details about the page here. Once you have entered all credit cards and entered the amount to be paid, the system will charge all entered credit cards and post one payment entry per credit card. It then will apply all invoices to the credit card charges.